Back in the pre-smartphone days, the Apple Newton was the first device in the PDA category. Newtons were only sold for five years between 1993 and 1998, when Steve Jobs pulled the plug on the program. Although Apple frequently took a ribbing for problems with the Newton’s handwriting recognition feature, its main problem with achieving market dominance was Newton’s high cost. Although it beat the wildly successful Palm Pilot to market, Newton could not compete on price. One of Newton’s accessories was a very compact keyboard (just a hair over 10 inches wide). I had one rattling around in my spare parts bin and it was the perfect size to use with the SunFounder Display and Raspberry Pi one-piece computer that I recently assembled. Only one problem, no way to plug it in. The Newton keyboard outputs a serial data stream and the RasPi (like most other modern computers) requires a USB keyboard. Further complicating matters, the Newton keyboard does not produce ASCII characters. Like the legacy IBM XT and AT keyboards, the Newt keyboard outputs a unique scan code for each key. One code is sent when the key is pressed and another gets sent when the key is released. I was surprised to find that nobody currently sells a pre-built adapter to do the serial to USB conversion. (Such adapters exist for IBM keyboards, but are not pin or code compatible with the Newt keyboard). The only homebrew solution I could locate was from a guy in Japan who posted this video but little else in the way of details. To make the Newt keyboard impersonate a USB keyboard, I would need to remap the serial data to USB. This job calls for a small, cheap, 5V tolerant microcontroller having both serial and USB interfaces. The Teensy 2.0 board is perfect for this purpose. It can impersonate all kinds of HID devices like mice, keyboards, joysticks, etc. and it is compatible with the Arduino IDE, which comes with a great keyboard library that can do all the heavy lifting. If you want to build your own adapter and are familiar with building Arduino projects, feel free to grab the sketch here. Pinouts are in the readme file and you can install the Teensy (or MC board of your choice) within the Newton keyboard or in an external enclosure. If you’d like step-by-step directions for my build, please continue reading. Teensy 2.0 microcontroller development board (there are several Teensy versions; make sure you use one that operates at 5 volts). A suitable enclosure for the Teensy. Note that there is plenty of room inside the Newton keyboard case. If you don’t mind opening it up, you can mount the Teensy board inside. Cut off the female end of your serial cable leaving at least a couple inches of wire. If you are using the Cables to Go cable, solder the brown wire to VCC (+5 Volts), the purple wire to D2, and the uninsulated shield to GND (ground) as shown above. Use a piece of shrink wrap tube or tape to cover the shield wire so it doesn’t short anything on the Teensy. Connect the keyboard to the connector you just soldered on and connect a USB cable to the Teensy. Mount it either inside the keyboard case or in a suitable enclosure. Install the latest Arduino IDE, if necessary. It can be downloaded here. Download and install Teensyduino, which is an add-on for the Arduino software that adds Teensy support to it. There are lots of digital inputs and outputs available on the Teensy. It might be nice to use one of the outputs to drive an LED that indicates Caps Lock state. Or perhaps it would be useful to assign some inputs to keyboard macros. This entry was posted in Apple, Arduino, Hacks, Raspberry Pi and tagged Arduino, Newton, Teensy on March 9, 2017 by ratranch. I needed a compact computer setup for my cramped electronics workbench. The SunFounder 10.1 inch display is both space- and cost-efficient. Instead of using molded parts for the case, SunFounder uses laser cut acrylic sheets, presumably to keep the cost of production down. 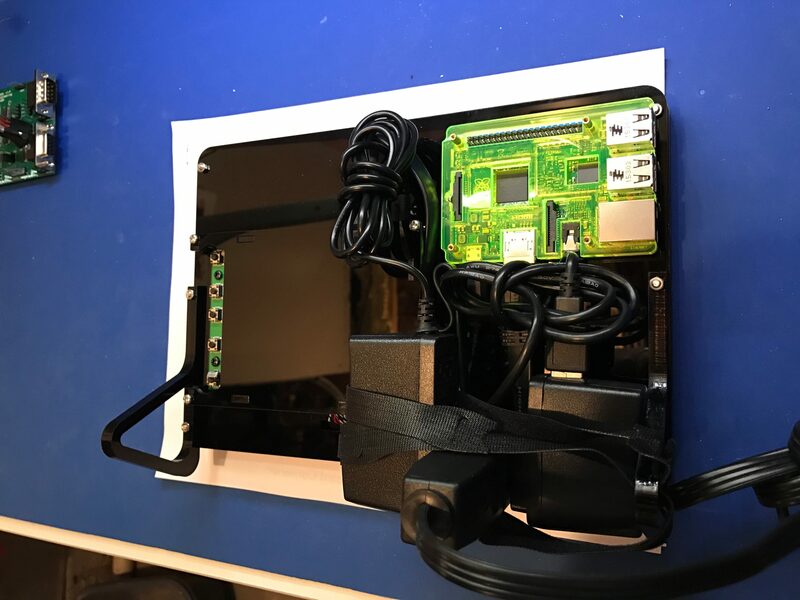 A Raspberry Pi computer can be mounted behind the screen. Although it has a few minor quirks, the SunFounder screen represents a great value. Recent price on Amazon was $110.99. Add a $25 RasPi, keyboard and mouse and you’ve got a very capable little one-piece computer for under $150. An onboard source of power for the RasPi would be welcomed. I suspect that a 5V connector that taps internal power could be added for less than the IR remote control that comes with the display. What possible use is a remote anyway? I can’t envision ever being more than arm’s length away for a screen that’s only 10 inches wide. Out of the box, I was getting no sound from the display. The printed instructions that came with the it said to run raspi-config and choose the option to force audio out through HDMI. But that did not work because the computer was detecting the SunFounder screen’s interface as DVI, which is not audio capable. The solution was to add the line hdmi_drive=2 in config.txt to force HDMI mode. These minor nits aside, for the price of a cheap Chromebook, the combination of the Raspberry Pi and SunFounder display provide several features that are useful on my workbench and would not be available on other similarly priced platforms like a built-in serial port, gpio pins and the ability to display HDMI, VGA or composite video. Next project, a perfect companion for this setup: let’s dust off an Apple Newton keyboard and add USB connectivity to it. This entry was posted in Apple, Raspberry Pi, Reviews and tagged Display, Newton, RasPi on March 8, 2017 by ratranch.